One of the smallest exoplanets yet discovered has just beenconfirmed as a rocky world, scientists announced. The planet, called CoRoT-7b, is the first planet beyondour solar system with a proven density similar to Earth's, astronomers say.Most known exoplanets are large gas giants like Jupiter. "We have indications that otherexoplanets could be rocky, but it?s the first time that the density of sucha planet has been measured," said study team member Claire Moutou of the Laboratoired?Astrophysique de Marseille in France. "We are really sure it'srocky." Though its terrestrial surface renders CoRoT-7b more similarto Earth than many other exoplanets are, it's still a far cry from a familiarsetting. The planet orbits extremely close to its star ? about 1.6 millionmiles (2.5 million km), or 23 times closer than Mercury is to the sun. 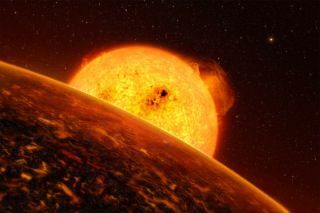 At thisrange, the planet's surface temperatures are scorching, with highs above 2,000degrees Fahrenheit (1,000 degrees Celsius) on the star-facing side. CoRoT-7b's close proximity to its star means that the planetis likely to be tidallylocked, with one side always facing its sun and the other side always indarkness. "Probably the day side is very hot and is pure lava,boiling, and the other side probably is very cold, and it could be rocky withsome mountains," Moutou told SPACE.com. "It's not possible that thereis liquid water." CoRoT-7b wasdiscovered in February 2009 by the CoRoT space telescope, a Europeancollaboration. The tiny planet was discovered orbiting a star slightly smallerand cooler than our sun, about 500 light-years away. As the planet passed infront of its star, it eclipsed a small portion of the star's light, causing adip in brightness. This dip was enough to tell that a planet existed, and toestimate the planet's distance from its host star and its radius, which isabout 80 percent larger than Earth's. But to learn its density, which wouldreveal whether it is a rocky or gas planet, requires a precise measurement ofthe parent star's velocity, which is slightly warped by the planet's smallmass. To make this measurement astronomers used the High Accuracy Radialvelocity Planet Searcher (HARPS) spectrograph on the European SouthernObservatory's 3.6-meter telescope at La Silla Observatory in Chile. The newdata revealed that CoRoT-7b has a mass about five times that of Earth, makingit one of the lightestexoplanets yet found. With the planet's mass and radius, the researcherscalculated its density (about 4.7 grams per cubic centimeter), which placed itin firm rocky territory. "This is the first proof of the detection of a rockyplanet," planet-formation theorist Alan Boss of the Carnegie Institutionof Washington told SPACE.com. "It shows that rocky planets really are commonplace,"said Boss, who was not involved in the new research. "The estimates arethat about 30 percent of sun-like stars have these hot and warm super-Earths,and now that we know the density of one of them, it is easy to make the claimthat most of the rest of them are probably rocky too. The evidence is becomingoverwhelming that we live in a crowded universe." Finding a rocky planet with an Earth-like density takes usone step closer to discovering another planet similar to our own. A twin-Earthbeyond the solar system could offer the best chance of finding life elsewherein the universe, scientists say. Although CoRoT-7b's lack of liquid water means it's unlikelyto host life, the planet's discovery is still a promising sign. CoRoT andNASA's Kepler space observatory are both up there as you read this, seekingsuch a discovery. "We are searching for any kind of exoplanets,"Moutou said. "We're trying not to be biased by our own system, but ofcourse we would be very interested to find a planet where life could develop.This one is not habitable, but some future planets of this kind could allowlife to develop. This is our long-time goal, to find an analog to Earth." The research team, led by Didier Queloz of the GenevaObservatory in Switzerland, described the results in a paper to be published inthe Oct. 22 issue of the journal Astronomy and Astrophysics.